This Encyclopedia is the first to compile some 500,000 pseudonyms of roughly 270,000 people. Besides pseudonyms in the narrower sense, initials, nick names, oder names, birth and married names etc. are included. 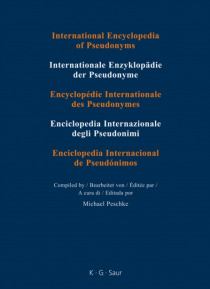 The volumes 1 to 9 list persons by their real names in alphabetical order, in volumes 10 to 16, the pseudonyms are listed alphabetically and the real names provided. To make identificat… ion easier, year and place of birth and death are provided where available, as are profession, nationality and more personal data.